Why can sticking fingers in an electric outlet kill you? I just wanted to learn some differences between volts, amps, ohms and so forth and came up with this question. If your skin has 100k ohms resistance and the outlet is 220v wouldn't the current flowing through your body be 0.0022 amps? Extract taken from this document. An interesting and related spin off subject is the well-known effect of a human body damaging electronic circuits by static discharge. The human body is modelled as a capacitance to earth of about 100 pF. This capacitance is charged up to several kV and the discharge path into the electronics under test is via a current limiting resistor. 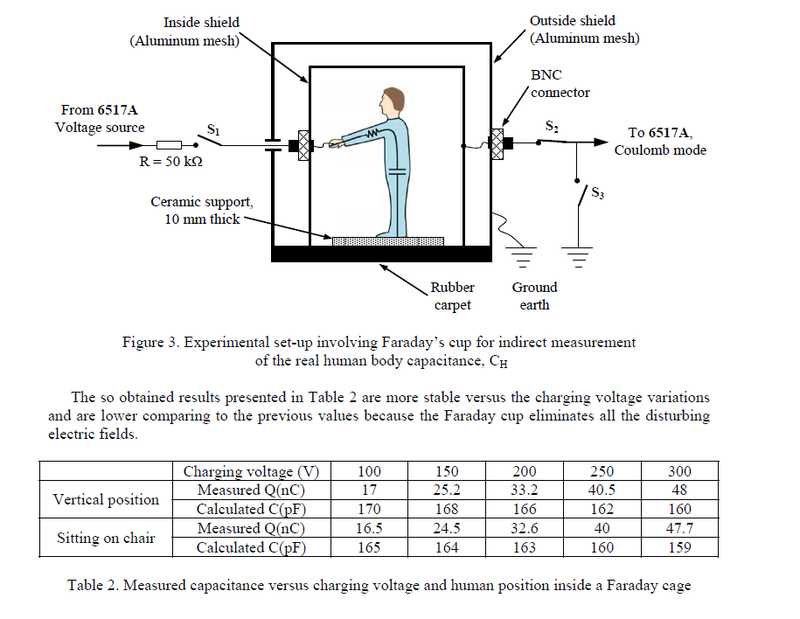 An important thing to note is that unless the human body directly connects to earth (a rarer situation than normal), the current flow due to touching a live wire is somewhat limited by this capacitance. So if we connect to 220V 60Hz, 160 pF has an impedance of 16.6 Mohms (reactive) and would cause a reactive current of about 13.3 uA. I don't think capacitive effects are going to be very significant. Unfortunately the 100kohms resistance is only true in some conditions. First you also have skin capacitance so it will conduct AC better than DC. Second, the skin resistance itself is not constant with the voltage even at DC; it goes down as voltage goes up. 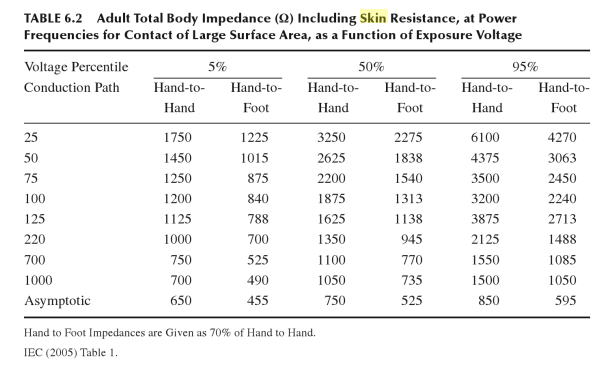 And third, there's variation with skin wetness/humidity including from person to person. I'll dig up some references for these facts I reproduced from memory. Have a look at this book Bio-Medical CMOS ICs for more details than I can hope to convey here. The topic is complicated because skin capacitance mostly depends on its thickness but skin resistance mostly varies with the number of sweat ducts and how full they are. So you can have an area with low capacitance because of thick skin, but which still conducts well if it has a high concentration of sweat ducts. As you said yourself, 2.2 mA will flow in your example. That's a lot of current inside your body. It will be painful at best, and can easily kill you if across a vital organ like the heart. Connecting two fingers on the same hand to the socket pins would merely be stupid, painful, and cause injury. Connecting between two fingers of opposite hands can possibly be lethal. And, this is assuming 100 kΩ total skin resistance. That is a plausible number when your hands are quite dry, but much less resistance is also quite possible. If you decide to do it anyway, let the Darwin awards people know first so that you can be properly recognized posthumously. That is correct, but your skin is not always 100k, the resistance varies a lot. And it does not take many mA to kill you, if it flows through the right (wrong) place. Hmmm. I'll go digging for sources (I had some when I was instructing in laboratories decades back and should find some by next month anyway), but what I recall is that the most dangerous region for shock (which is primarily concerned with conduction through the heart, since blood is where most of the electrolytes are at and most internal conduction thus follows the blood vessels) is between 10mA and either 1 Amp or 100 mA. This was required reading for my work in a high voltage laboratory, as was the charming tale of how many solid concrete walls a 3000 PSI A cylinder could launch itself through if you didn't chain it to the wall, and the valve broke off when it fell over. I think Olin's claim for 2.2mA across the heart being lethal falls down, being half of what GFCI's are set to trigger at (5 mA, at least USA-versions.) That level is half the lower end of the most dangerous range, not more than twice what it would take to kill you, or there would not be a lot of point in GFCIs. 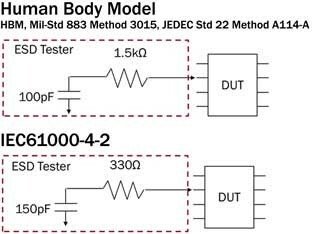 The "low skin resistance body model" is also where the "safe" voltages come from, based on potential current through the heart IIRC. No, I'm not volunteering to test it (though I have once or twice involuntarily done so and been lucky), but I think more or less accurately knowing what's going on beats inaccurate fear-mongering. Don't go poking your fingers into outlets, but do that because your skin resistance is not a fixed number you can depend on, especially if you cut your finger on a sharp part of the outlet; and it's stupid to put your finger in an outlet, which really should be sufficient all by itself. Below 10mA, the current is claimed to be insufficient to cause fibrillation (an induced heat attack and the major cause of death by electrocution.) Above the high end the current is enough to stop/clamp the heart, and it's more likely to restart than in the "most dangerous region" though there can be other bad side effects such as burns inside the blood vessels - this tends to be where the folks that survive lightning strikes land, IIRC. As already mentioned, skin resistance is HIGHLY variable with sweat (salt-water more or less) having a large influence. Cuts remove it entirely. As for WRB's 47 uA pacemaker, I submit that the pacemaker might be a rather different deal than any normal source of shock - or there was indeed an error there. It's also important to keep in mind that the current path has to include the heart or lungs to cause immediate death, and so the other point of contact has to be kept in mind - usually the other hand or the feet (standing in wet conditions). If the environment it wet, it seems likely that the contacting fingers might be wet as well. The heart is actually quite sensitive to current applied directly to it, with currents less than 1 mA being seen as hazardous. Current standards take this into account in the certifications for medical equipment, but I remember in the mid-60s reading of a case of an externally powered pacemaker accident (improper power supply grounding and patient touched a grounded metal bedframe) which was lethal at 47 uA. Net discussions of microshock seem convinced that such cases are apocryphal, but I stand by my memory. Although the original article may have been in error. You are making two errors here. Second, you are basically betting your life that the skin resistance is really 100k. That can change drastically if your skin is even a little bit wet and suppose there's a tiny burr on whatever you touched that poked ever so slightly into your skin--that will drive the resistance way down. Not the answer you're looking for? Browse other questions tagged power-supply voltage current resistance outlet or ask your own question. How did I survive this shock? How much electricity a human can conduct? Why is it safe to touch the chassis of a tube amplifier and something earth grounded simoultaneously? How can a faulty USB charger kill you? Is it possible to increase the amps within or along a basic circuit? Why can people touch high voltage? If the voltage doesn't kill you, does the current capability matter? Plugging the same device on a jack of smaller tension will draw more or less current? Difference between 110V and 220V power outlet? How is it possible to have high voltage that is safe?